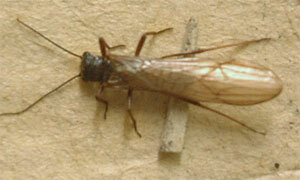 Adult Plecoptera rarely fly in cold temperatures. 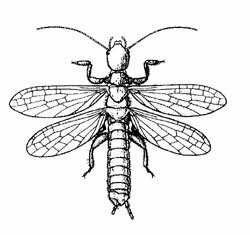 The Plecoptera inspired a recent theory on the origins of insect flight, as the adult wings are rarely used for flight, but are flapped by the adults to skim across the surface of the water. This theory suggests that rowing winglets would have been useful to the insects before they were big enough for flight. Males attract mates by drumming on the surface of the substrate with the tip of their abdomen. 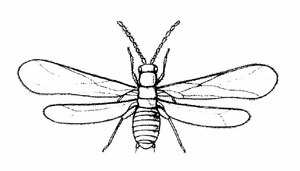 Embioptera are highly evolved for life in their tunnels; their wings can bend at any point, and must be stiffened with blood before flight; their hind legs are muscled to allow rapid running in reverse; their caudal cerci are used as eyes to navigate whilst running at high speed. 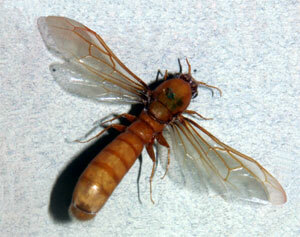 Embioptera are the only insects which produce silk as adults, generating it in the glands in their enlarged front tarsi. The Cooloola monster is highly evolved for its burrowing lifestyle, and very unlike most other Orthoptera. When it was discovered in 1976 it was thought to be a hoax, but has now been assigned to its own family- Cooloolidae. 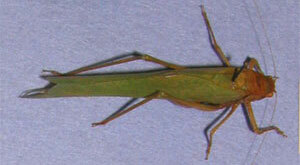 Locusts are large grasshoppers, renowned for their gregarious associations. 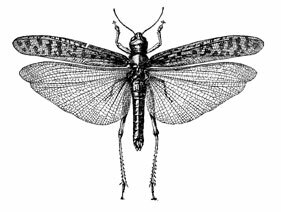 The biggest swarm ever recorded consisted of 12.5 trillion Rocky Mountain Locusts (Melanophus spretus), which covered an area the size of England, Scotland, Ireland and Wales. 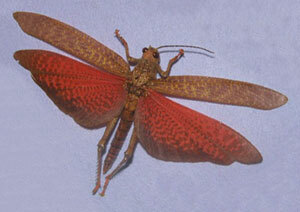 Schistocerca gregarius, the desert locust, is the world's most destructive insect. Every day a swarm of 50,000 million desert locusts eats the amount of food needed by 500,000 people for a year. Male mole crickets (Gryllotalpus gryllotalpus) (Family Gryllotalpidae) shape their burrow in order to amplify their mating songs, enabling them to be heard up to 1.5km away. 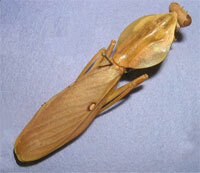 If attacked, some stick insects will fly away, but most fall to the ground in a cataleptic state. Exceptions to these reactions include hissing, startling the predator by flashing bright wings, or slashing out with the hind legs. The most offensive methods involve secreting or spraying obnoxious materials from repugnatory glands. 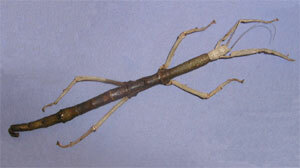 Despite its current familiarity, the Indian stick insect, Carauxis morosus, now found in many schools, was undiscovered until 1908. Pincers are used offensively and defensively, helping the wings to open and close, and during copulation. 15 exotic earwig species live on bats and rodents. 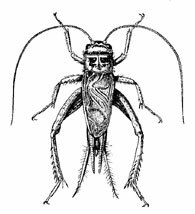 The German for earwig is ohrwurm - earworm, and the French is perce-oreille - ear piercer, the Old English term was ear-wicga - ear insect. These titles may have arisen when people slept at floor level, and found earwigs searching for dark cavities. Another possible origin is the ear-shaped hind-wing. The world's largest earwig is the St. Helena Giant Earwig, which can reach up to 7.8cm in length, including pincers of 2.4 cm. 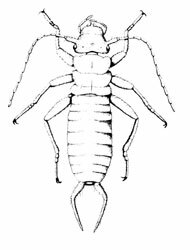 This is also the rarest earwig, and is feared to be extinct. 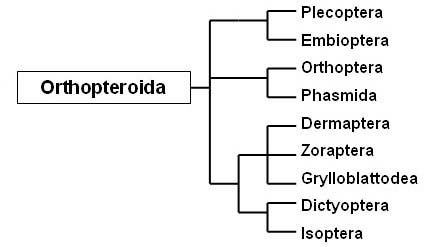 Zoraptera were only discovered in 1913. Found in aggregations, but there is no evidence that they have caste systems. The Order Grylloblattodea is the most recent order to have been accepted, and was only established in 1932. The Mount St. Helens Grylloblat (G. chirugica) is the only known endangered grylloblat species, probably due to its location and man's interference. Prey on other insects, occasionally small reptiles etc. 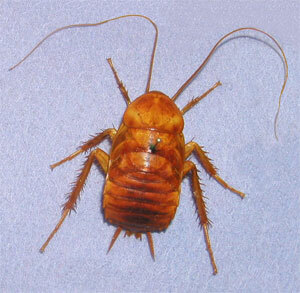 Cucumber skins and bay-leaves are useful cockroach repellents, and the male pheromone is used to attract females to traps. 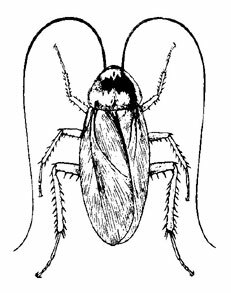 The fastest cockroach, Periplanta americana, runs upright on its hind legs to achieve a top speed of 1.5m/s. Females of the larger mantid species often eat the males during mating, using them to nourish the eggs as well as fertilise them. Most colonies have a king and queen, as well as many sterile workers and a small proportion of large-jawed soldiers. Termitaria are highly advanced structures, which provide: insulation against heat, cold and desiccation; convection of air currents; waterproofing; gaseous exchange across the surface; regions for fungal gardens. 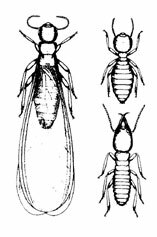 The largest termites are the queens of Macrotermes bellicosus, which can reach 14 x 3.5 cm.